What’s a better way to style than to add mesmerizing colour-changing stone jewellery to your ensemble? Alexite provides you just that! With its transcending glimmer and exotic hues, the stone has an unmatched glamour. Find a riveting collection only at TJC. Add a little drama and showman flair to your jewellery choice as you clasp on something studded with Alexite! With hues transitioning from blue to purple and green under various lights, the uniqueness of this gem all worth the demand! While some people regard it as a magic stone, Alexite has forever captured people’s unrivalled interest with its bold properties. Alexite is a synthetic stone and it is made for use with the help of laser techniques. Known as one of the most successful and proud tries in the history of simulated gemstones, Alexite holds all properties that are dear to a connoisseur of marvellous gems. 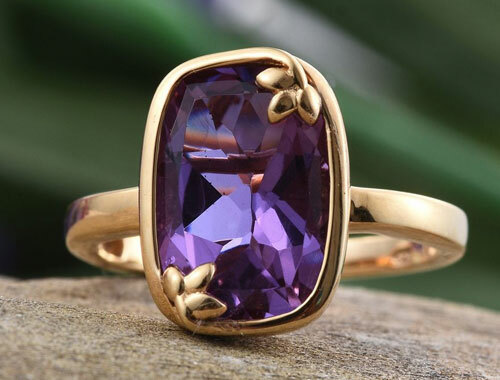 Created out of synthetic glass, which contains rare earth minerals, the stone is found being compared to Alexandrite. The whole process makes the stone very tough and durable, given the lot of thought and research that has been put into perfecting the quality. The method of the production of Alexite was introduced in the period around 1800s, but there have been small variations in the process, which evolved in 1975. Found majorly in India, this stone is traded to other countries as well. But the trademark rights remain with the creators in India. With a celestial gleam, Alexite has held the fancy of plenty. The colour-changing property is just an added bonus over the glittering brilliance of this gem. Holding a hardness that ranks at 5.5 on Mohs scale, the stone has been structured to be durable and long-lasting. However, it can chip off easily. Taking its qualities from one of the most sizzling stone, Alexandrite, Alexite has been synthesised to meet the high expectations of all jewellery lovers who dote on rarity among sparkles. While Alexandrite offers you red-green transition in hues, this artificial gem offers you several shades of blue, purple, and green under different lights. It should also be taken into consideration that Alexandrite, however is naturally-occurring, is also very expensive and rare. Alexite has been made of elements that render it a much thriftier option when shopping for glamorous jewellery. The main use of any stone that sparkles is to remove all the negative energy. Shamans all across the globe use it to ward off the despondent thoughts from an individual’s mind. There are several uses of the stone in the records. Many people wear it as an amulet as they believe that the stone makes the mind calm. Many pandits suggest the gem to the people who struggle with anger issues. For people who find themselves caught in emotional turmoil and instabilities, the stone is regarded as a talisman. Some people also think that the colour change of the stone directly portrays the mood of a person. While other people find the changing hues as the changing health the individual who wears it. Here have been almost no legends related to the stone as it is not that old and it is synthesised. Regardless, many have faith that it balances out the chakras in the body, between the mental, astral, and physical elements. Cleaning care for Alexite is much like the procedures for other coloured gemstones. You can opt for the easiest method, which starts with soaking it in lukewarm water. Place your jewellery in bowl containing slightly warm water along with a few drops of dish soap. Using gentle force, clean the stone using your hands. Later, you can rinse it under cold water and pat dry with a soft towel or chamois cloth. You must keep away your jewellery from any harsh external condition that might result in scratches and abrasions. Alexite is a synthetically produced gemstone, which holds colour-changing properties along with a sizzling glitter. The stone ranks 5.5 on Mohs scale of hardness, which makes it strong, durable, and incredibly long-lasting; all things you want in your jewellery. That said, it can chip away if it suffers blunt force trauma, so care is necessary. Relatively new to the market, there are not a lot of legends related to the stone, but Feng Shui uses it deflect negative energy from the rooms and individuals. The stone shows different colours when placed under different lights. It shows transitioning between purple, green, and blue. When you place it under artificial lights, the hues might range from deep purple to almost lavender, but in natural light, Alexite becomes pink. While Alexite shares a lot of properties with Alexandrite, it is a much cheaper stone in comparison. Alexandrite is a naturally-occurring stone, which also has colour-shifting property, but with a lesser range than Alexite.